I knew I didn't want to end up with a unicorn with a non-existent muzzle like the Prancing Pony Cake, but I needn't have worried. I found inspiration in the party decor! 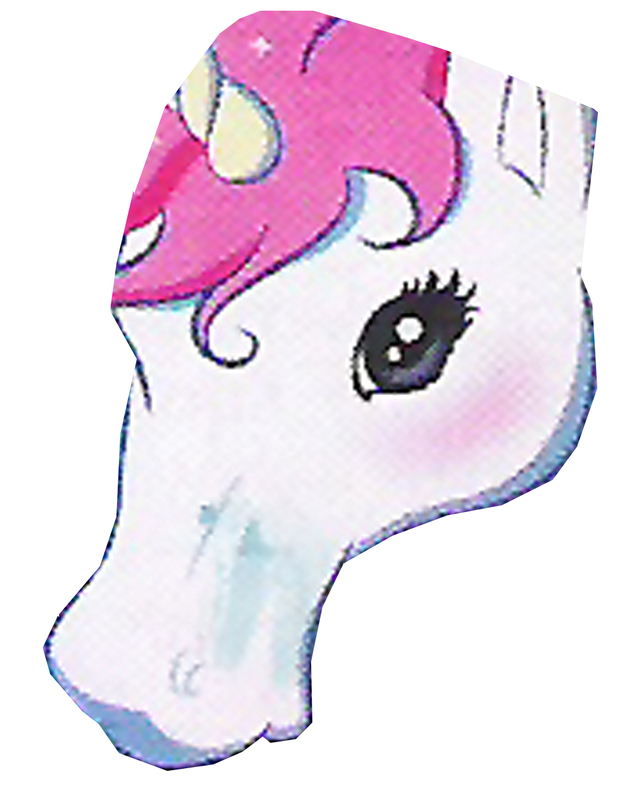 I scanned the catalog page, enlarged it, and used the picture as a template for cutting out the unicorn's head. The unicorn cake is a 2 layer cake carved from a single 9x13 cake (I used Pillsbury white cake mix). This could also be turned into a horse cake - simply leave off the horn! I first cut out the head, keeping the cut out section as far to one side as possible (since the remaining cake would form the neck and base, supporting the head). The ear should also be part of this piece. The head piece was then carved and rounded to resemble a unicorn head. It doesn't need to be very detailed. Icing will help to round out most of the cut edges and can also be used to add details later. With the remaining cake, shape the neck area. You need to be sure to keep a large enough piece of cake to go beneath the head, supporting it and creating a 2-layer cake section. I placed the head template on the cake and cut around it adding the neck as I went so the top and left sides of the cake would match the head piece perfectly. You can't see it in the photo, but I also made a second ear part of this base piece. It sits more forward on the head than the first ear and helps to support the horn. Place the base piece onto your serving plate and cover completely with icing. I used canned Pillsbury vanilla icing. Place the head piece on top of the base piece and arrange it toward the top left of the cake aligning the top of the head and the left side of the head. Ice the top layer and all the sides. Your cake should now be completely covered in icing. If you like, you can make a icing border along the base. It's only needed at the bottom of the neck and along the left side of the cake. The rest will be covered in icing from the mane. Color a can of vanilla icing pink. Place it in a decorating bag with a large star tip and pipe on the mane. Start at the base of the cake and work your way up. Bring the mane up over the forehead in curls. Use a small butter knife or spatula to spread a little icing in the ear. I drew on the eye with black decorating gel and painted in the iris with blue food coloring gel (slightly watered down). For the nose, I made an indent in the icing and the same blue color used on the eye was swiped on with a paintbrush just at the top of the nostril. 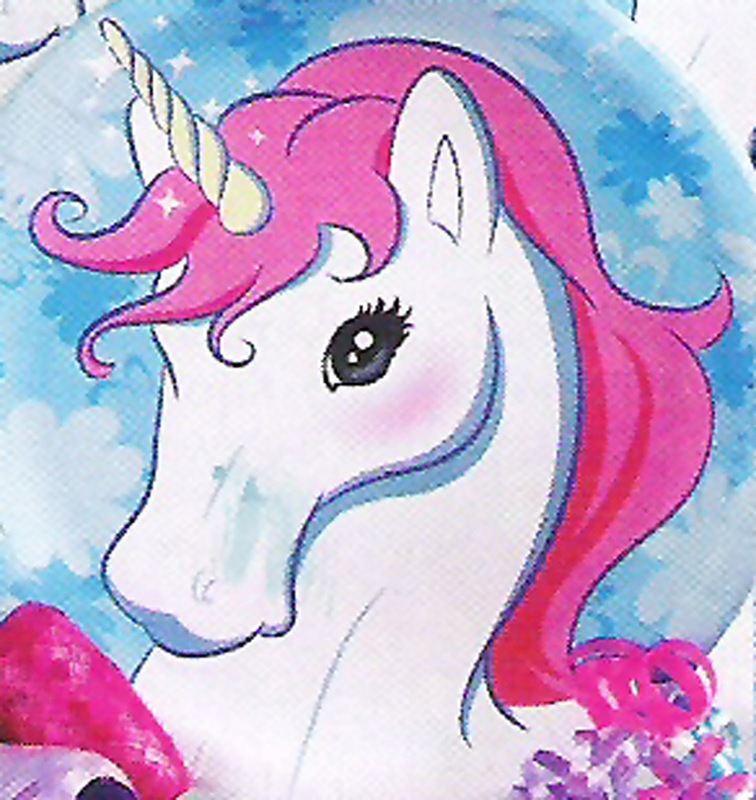 The unicorn's horn was made from marshmallow fondant. I mixed up a batch, rolled it into a long rope with a tapered end and twisted it around half of a bamboo skewer. Start at the end of the skewer with the tapered end and twist keeping the fondant tightly wrapped until you run out of fondant or get to the middle of the skewer - whichever comes first. The entire horn was then dusted with silver Pearl Dust - edible metallic decorating powder. 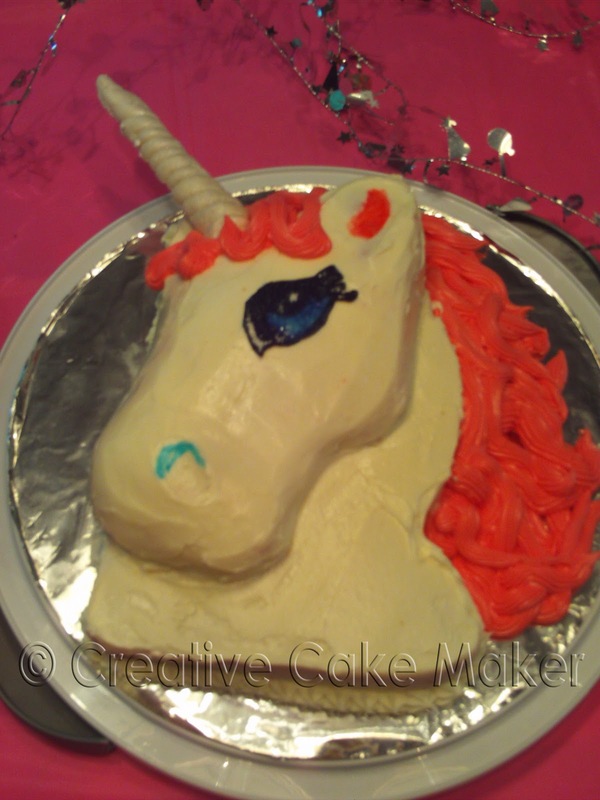 Insert the uncovered end of the skewer into the unicorn's head just above the ear on the bottom layer but as close to the seam between the cake layer as possible. The horn is heavy. The bottom ear, the length of the skewer and the weight of the top layer of cake all help to hold the horn in place.